Daily flights from Jakarta, Semarang, Pontianak, Surabaya and Banjarmasin to Pangkalan Bun and a few flights a week between Surabaya and Pangkalan Bun. Tickets are now only available to be booked a month in advance. There are daily flights from Jakarta, Pontianak, Banjarmasin and Semarang and Solo with Kalstar. 1. 100 % cancellation charge for booking cancel within 24 hours. 2. 75 % cancellation charge for booking cancel within 72 hours. 3. 50 % cancellation charge for booking cancel once deposit paid. All participants will stay in small hotels, guesthouses, lodge, and local house and on house boat. In some cases you have an option to stay variety of finest hotel. These will vary from place to place but in all cases the accommodation will usually be owned and operated by local people. This way, your money will be directly reaching the local people of the place you are visiting and not large corporations. Your money will also support us to gain alternative income for the local people and helps to protect their tradition. You will receive daily breakfast and refreshments en route. You will accompanied by a cook Orangutan House Boating Tour who will serve fresh food for you as for lunches and dinners are all include. Our guide’s knowledge about spots is profound and experienced. Our guide team is a local people as our main goals to helping in contribution of their income. Due to our packages are not covered with insurance, so we suggest you to take out your own insurance to cover yourself and to cover importance goods such as camera and others. We highly recommend that you have to purchase your own travel insurance, prior to trip departure. We acts as intermediary for transport carriers, accommodation, restaurant and other component that use during the program, assumes no responsible for any delay, change of schedules, Cancelled flight, miss flight connections, loss, damage, injury, theft, accident, and irregularity. Luggage allowances in several aircraft such as Kalstar Aviation Balikpapan- Berau & Pangkalan Bun only 10 Kg and Jet plane will be 20 Kg. Due to all causes beyond the program, we reserve the right, without penalty, to alter itineraries or program. 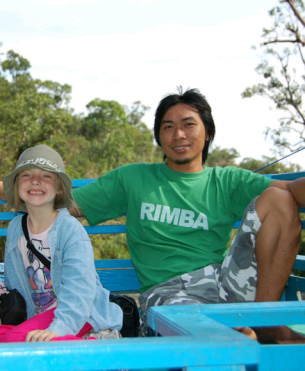 All our trips are designed for a gentle adventure level, even suitable for young families. If you prefer to do more strenuous or adventurous trekking, then our guides can also make sure you are happy too. No specific skills are needed to join our trips – just a desire to see new and interesting wildlife, experience true adventure, and are spectacular of the forest and its inhabitants! For Orangutan tours most of the food is Indonesian food which is prepared hygienically, and is wholesome and delicious. To protect your skin from the sun and mosquitos, you should use high factor suntan lotion and insect repellent. Repellents containing ‘Deet’ work best, but are very strong on your skin, so alternative more gentle and natural products such as ‘Mosiguard’ can be used instead. Kalimantan is malarial, so please seek advice for antimalarial or protection from bites before you come. Both suntan lotions and repellents can be purchased in Pangkalan Bun, and sometimes in Kumai, but they can be difficult to find – so best to bring them with you if you can. For standard klotok trips, no special equipment or clothing is required, but you may like to bring some of the following: Sun glasses, a head torch, binoculars, light coloured long-sleeved tops and long trousers (for insect and leech protection), a rain poncho (for sudden downpours in the forest! ), old trainers/comfortable footwear for forest treks, camera with extra batteries and film/memory, a day sack for taking on treks, some high energy snacks like nuts/dried fruit/flapjacks for if you need them in between meals while trekking, a light weight hammock for resting on treks, a towel; a sarong (multiple uses!). Our trips run throughout the year, but the most popular time to travel is from June through to September when there is less chance of rain. However, being a rainforest, short storms can be expected at all times of year but are most prevalent from November through to May. Temperatures in the rainforest are warm and the humidity is high. You will need to get accustomed to the humidity and drinking plenty of water is necessary at all times of year. 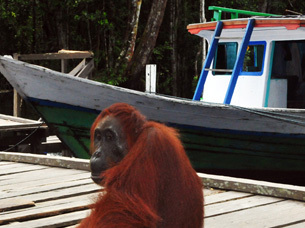 Tanjung Puting National Park, Orangutans and Their Habitat – Published in 2007 by Orangutan Foundation and Yayorin. •NEVER INITIATE CONTACT: Never approach an Orangutan. If an Orangutan attempts to make contact, retreat slowly. If an Orangutan grabs you; stay calm and avoid sudden or jerky movements. If you can’t gently twist your arm free – call for help. Never travel alone in the forest. 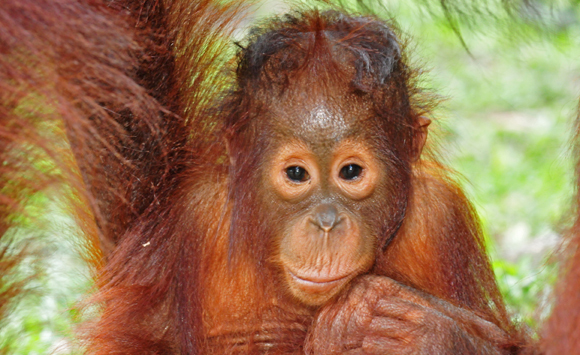 An Orangutans may seem gentle, however they can bite so do not be tempted to initiate contact. • AVOID ORANGUTANS IF YOU FEEL UNWELL: Colds, flu or any respiratory or gastrointestinal diseases can be passed on to the Orangutans (and vice versa). Avoid coughing near Orangutans. Wash your hands frequently with soap and water. • LEARN TO RECOGNISE MALE ORANGUTANS: Sub-adult and adult males are much larger in size, have large cheek pads and beards. Unlike wild males, ex-captives are less afraid of humans. If, on a rare occasion a male ex-captive charges – run. It is your responsibility to check current passport and visa requirements with the Indonesian Embassy before booking. It is your responsibility to obtain all documents required for your stay in Indonesia, to ensure that these are in proper order and to take them with you. We will not be liable if you fail to do so and you will be responsible for meeting any additional costs incurred by reason of such failure. It is essential that you take out your own comprehensive travel insurance to cover your tour. We hold no responsibility for any personal accidents or illness which occur while on your klotok, or in the National Park. You take a tour at your own risk. All baggage and personal effects are at all times your own responsibility. If the behaviour of any member of any party is considered likely to cause offence, danger, damage or distress to others, we reserve the right at all times to cancel or terminate a tour completely. If, for example, any tour staff considers that the behaviour is unacceptable, they are authorised to terminate a tour wherever and whenever necessary. If this situation arises, we will not be obliged to cover any expenses incurred by the party concerned and neither will we consider any claims for compensation or refunds whatsoever. We will also be within our rights to impose cancellation fees.